As I have mentioned before…repeatedly…again and again…more times than you can count…finding containers that will work in 1:6 scale is, shall we say, challenging. I probably spend more time surfing the web for plates, baskets, bowls, cups, cocktail glasses, etc. than I do actually creating the food and drink that will go in/on them! It can, at times, be very disheartening. There is SO much available for the collector of dollhouse scale items. The 1:6 scale divas here at OSS go green with envy when they see all the sumptuous items available in 1:12 scale as I click past them online with a frown and a growl. And there seems to be a plethora of items referred to by sellers as “miniature” (bottles, vases, bowls, etc.) that measure in at about the 3 inch tall range which is too tall for 1:6 in most cases. And it doesn’t help when a lot of what is called 1:6 scale really is not; it’s smaller. And we do tend to fudge a bit on some things, and they look fine. Here is one of my favorite ceramic bowls alongside a bowl that most of you will recognize and probably have in your kitchens. 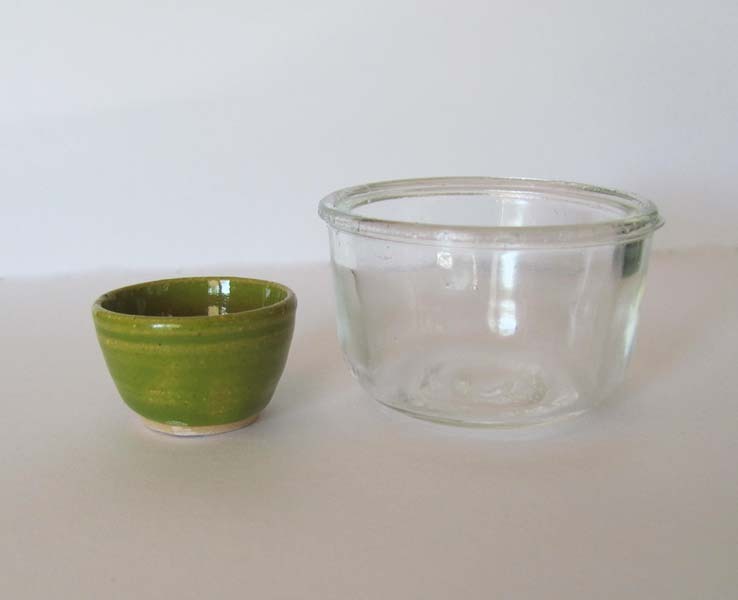 This bowl is the approximate TRW counterpart to my lovely green miniature bowl (found on Etsy). The rust colored bowl in this photo is approximately 7 inches in diameter across the top and 3 5/8 inches tall. It is not the size of bowl most people reach for when they need a BIG mixing bowl. This post is about my quest to find a better bowl, a bowl suitable for mixing of the kitchen kind, a bowl that would be what your domestic diva reaches for when she needs to bake a cake or whip up a batch of pancakes or shortcakes for those luscious strawberries she just bought at the grocery store. I want the bowl to be big, and I want it to be clear glass. I didn’t think that was too much to ask. Apparently, it’s WAY too much to ask. 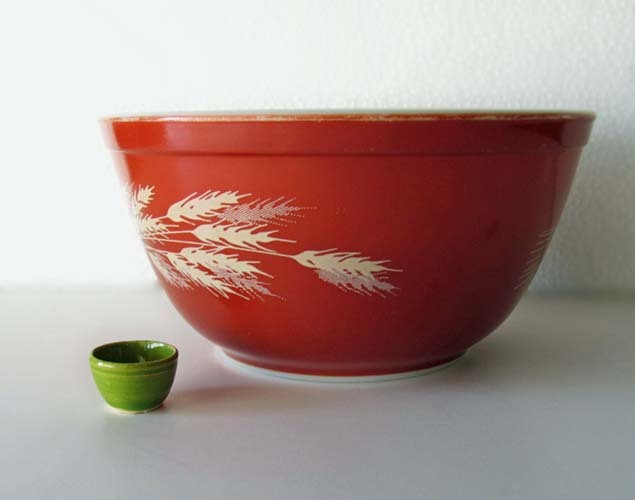 Bowls in proper scale are difficult to find in any color or material. Clear glass bowls, in the 1:6 scale world, do not exist to the best of my knowledge. So…I had to turn to TRW. I turned there without knowing that I was turning there. That is to say, I stumbled across my find, and it made me LOL. That last term is used much too much nowadays, but in this case, I really DID laugh out loud when I found the item I found. And then, my dear husband said, upon learning of my find, “Oh, yeah…I remember those!” Really? REALLY?? So, all those times I whined about not being able to find a clear glass bowl shaped like this one in our cupboard and about oh, this big…all those times you didn’t say, “Hey, maybe this thingamajig might work for that?” Hmmmph!! At any rate, you will never, and I do mean NEVER, guess where I found this particular clear glass mixing bowl that is not really a clear glass mixing bowl at all. Oh, really? You think you can guess. Okay….go for it. (insert Jeopardy music here) Give up? The yellow bowl is approximately 10 and 1/2 inches across at the widest point and a little more than 4 and 1/2 inches tall. 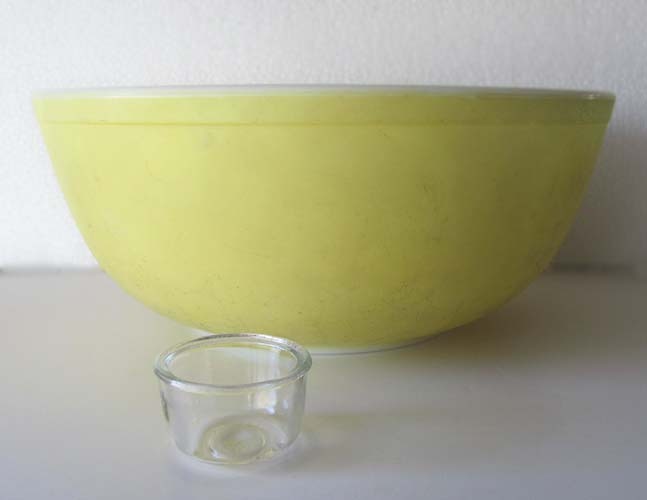 The glass sediment bowl (from this moment on now known as the clear glass, 1:6 scale, mixing bowl) is 1 and 7/8 inches across at the top and approximately 1 and 1/4 inches tall. 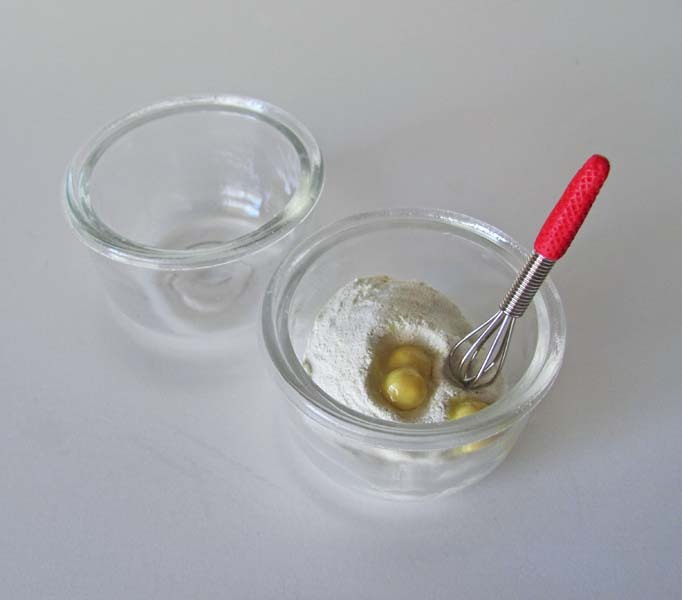 So…in TRW, the clear glass bowl would translate into a slightly larger bowl than the yellow bowl, but not so much that it looks out of scale in our 1:6 scale kitchens. Hooray! And the reason I wanted a clear glass bowl should be obvious to you. I wanted the bowl’s contents to be visible from any direction and not just from directly above the bowl because, in the world of OSS, it’s all about the food! And just because I need to insert a plug for the OSS Etsy Store and its most recent item featuring the new, clear glass, 1:6 scale mixing bowl, here’s the OSS diva DASHA in her retro kitchen. Doesn’t she look thrilled to be wearing an apron? She was not amused. But I was! DASHA whips up some shortcake in the OSS kitchen! Baking Bowl with your choice of Whisk color available in the OSS Etsy Store! That glass bowl is perfect! I love the pink fridge/setting, too. Leave it to dear hubby. Silly man. Does he not wear his 1:6 eyes all the time? Your baking set is terrific, as usual, Sweetie. I know, right! lol Does the man not know what I do? Hehehe, fantastic, searches that pay off, I know of this and applaud your persistence, not to mention these great stories that I can relate to and put a smile on my face. Love your blog on all levels Dawn. We can be a bit obsessive, can’t we? Ha! Thank you, Brenda. Hugs! This was kind an odyssey but with a happy end. 🙂 It’s unbelievable on what unexpected places so cool items can be found!! Both sets you made using the new bowl are amazing and I also love the wire whisks! We always need to have that “1:6 scale eye” when we are shopping, don’t we? So funny where “doll” items can be found. Thanks, Silvana!